There are a number of reasons why you have cracked cuticles and ragged skin around the nails after a professional or home manicure. Never cut cuticles. Even your nail technician should not be cutting your cuticles. Why? The cuticles provide a barrier of protection for the nail bed from damage and from bacterial and fungal infection. Cutting makes the cuticle hard and can easily crack and become prone to infection. Is your manicurist using too aggressive and harsh handling of your fingernails? In addition, some nail technicians use strong and irritating solvents to remove cuticles. These solvents break down keratin (protein in the cuticle), but this can cause inflammation and infection to the nail root, nail bed, and surrounding skin. The use of sharp instruments under the nail or metal cuticle trimmers can lead to cuts and therefore infection and inflammation. Bring your own manicure set or make sure new or sterile instruments are used at the nail salon to avoid bacteria and germs. Also if you use your own set, make sure you keep the tools clean by soaking them in alcohol between manicures. If you have red, swollen and peeling skin after a manicure, you might be getting allergic contact dermatitis from nail polish, acetone nail polish removers, nail hardeners and/or glue used for wraps, tips, and artificial nails. If necessary, use an antibacterial ointment and leave nails natural until the condition clears. If you have red skin with puffiness, soreness around the nails and oozing, you could have paronychia, a skin infection. You should see a doctor for treatment. Do not have manicures when you have an infection, which can make it worse by spreading the infection to other nails and the surrounding skin. If you regularly take care of the cuticles, they won’t become hard or unsightly and there will be no need to trim them. For cracked cuticles, massage with an emollient oil or cuticle cream. Don’t bite hangnails, which can further tear the skin. Cut away hangnails with cuticle clippers and scissors, taking care not to clip and injure the surrounding skin. Gently push back moistened (never while dry) cuticles once or twice a month with a cuticle stick or orange stick. Do not jab. Using a towel or washcloth, push back cuticles after taking a shower or bath while cuticles are more pliable. 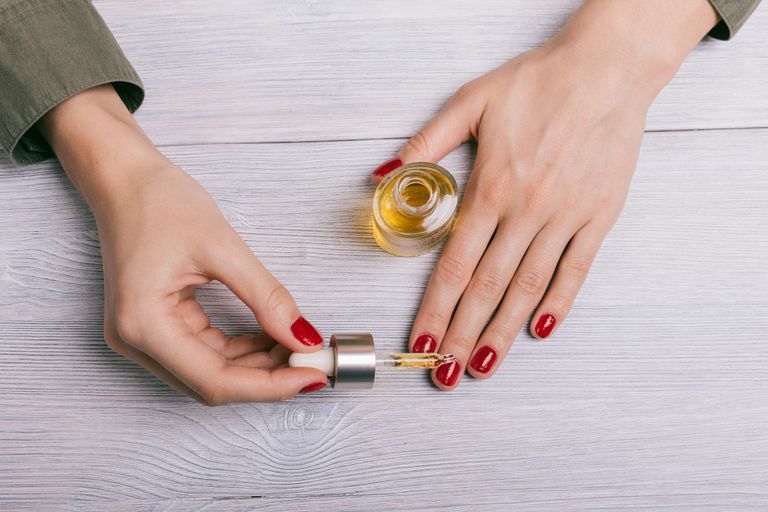 Soak nails and cuticles in cuticle oil, vitamin E oil, almond oil, or olive oil for 10-15 minutes. Exfoliate with oil (olive, almond, etc.) mixed with a little sugar and massage into cuticles in a circular motion. Rinse, dry, then massage cuticle moisturizer and cream into the cuticles. Keep cuticles moisturized with a cuticle cream (good ingredients—glycerin, shea butter, safflower seed oil) or use a natural oil (vitamin E, almond, olive, flaxseed oil). Apply lotion, moisturizer, or cuticle conditioning oil to cuticles and hands and wear gloves at night. Wear gloves when washing dishes and cleaning. Before putting on gloves, apply oil or lotion for additional treatment while you work. Give the nails a rest from gel manicures, polish and artificial/acrylic nails.